Seeing all the places my feet will take me! I am a runner, adventure seeker, mom, wife and so much more. Come along on the crazy adventures and if we happen to be in the same place and the same time,come join the fun! I have officially crossed over to the dark side! Ok not really… But that depends on who you ask! After months of anticipation, training, questioning myself and hundreds of training miles, the weekend of the Titletown Ultra was upon us. June 25th was a day that, when I signed up for this race, seemed like it was so far away. And apparently, when I wasn’t paying attention, the calendar flipped to June and the last weekend of the month was upon us! Yes, I understand that June 25th was about 10 days ago, but it took me a few days to recovery and really wrap my brain around everything from this weekend. Then I struggled with where to even start! (then the 4th of July Holiday and a long weekend up north got in the way of sitting down and actually writing this!) Now that I think I have written this post about 15 times in my head, it’s time to actually put it into words here! Don’t get me wrong, I’ve done quite a few races in the last few years, but this one was like no other! Up until today, my longest race ever was a half marathon and my longest training run was 20 miles. This was a whole new beast! 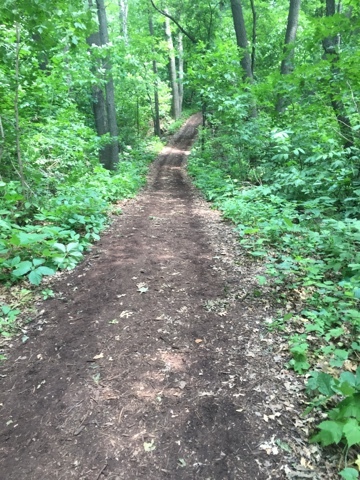 For those of you that are not familiar with the Titletown Ultra, It is held on the trails on the campus of University of Wisconsin, Green Bay, They have 3 different events to choose from – 6 hours, 8 hours of the 15 1/2 hour Solstice option. The course consists of a 4.75 mile loop with the main aid station at the start line and 2 others around the loop. I felt like I spent the few days before the event running around gathering stuff that I was going to need, kinda like a squirrel gathering food for the winter. The pile was growing… and growing! Since this was my first race of this magnitude, I really didn’t know what to expect. 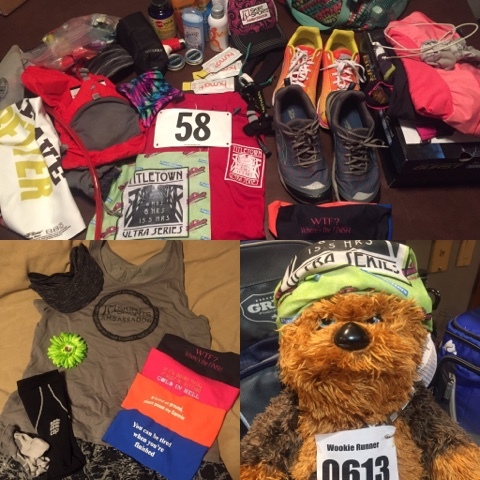 But by Friday night, I had a pile of gear that looked like I was getting ready for a week long adventure instead of just a single days race! I will be the first to admit it, I am a chronic over packer. “but what if I need it?”, “I might need this”, “oh this could come in handy” the questions were numerous and I really didn’t know how to answer them. I discovered that going online and Googling what to pack for an ultra marathon was not going to help me. I didn’t own half of the stuff that was on some of those lists! And I had one huge luxury that most ultra marathoners don’t have – I didn’t have to figure out what to put in a drop bag that would be waiting for me at the halfway point with whatever I though I was going to need, and then another bag to be waiting at the finish line. There was space at the start line/main aid station for us to leave our gear! 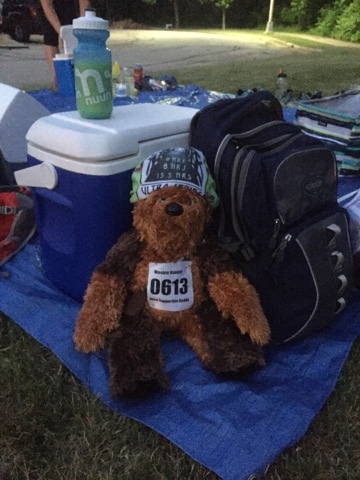 This meant that I was able to bring a cooler filled with ice and cold beverages, my bag with dry socks, fuel, extra shoes…. everything I “might” need”. After heading to packet pickup and then prerace fueling at HuHot, it was time to head home for last minute preparations. My good friend (that I met at a race a few years ago) was crashing at my place to save herself some drive time in the morning and I think we double and triple checked everything 4 times! After feeling like I got no sleep the night before, Tracie and I were up well before the crack of dawn (race was starting at sunrise) so that we could make the drive across down to meet up with the other 90 crazy runners that would be our companions for the day! Every time I head out to a race, I never know who I am going to run into. This race was a little different. Since it is such a small venue and registration is pretty limited (I think I heard a total of 97 runners this year) I knew quite a few people that were going to be there. Plus friends of those friends, so it was kinda like a family reunion! Some people, I met over the years at other races, some through the local running club and others via the internet! Yup, the internet! Kim (with me in the above photo) is one of those internet ones. We met a few years ago through one of the Facebook running groups we both were part of. Through general posts online, we realized that we both lived in the same area! Since then, I’ve run into her at a few different races and we actually spent the last few months comparing training stores! Today we were both running our first ultra marathon, both with goals to hit the 50k mark. 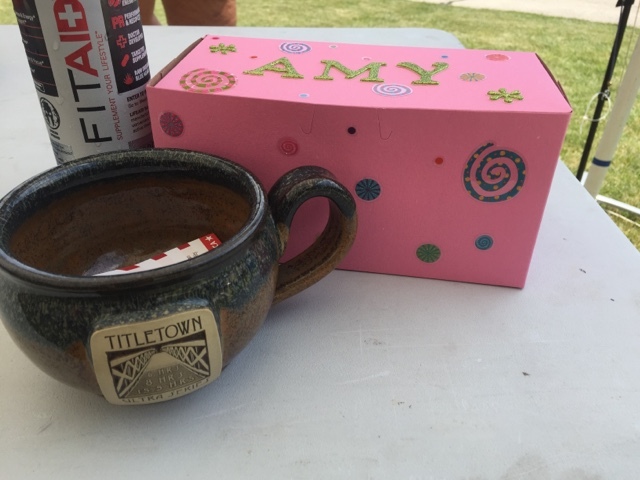 The biggest difference – she’s got a few full marathons under her belt, a challenge I have yet to take on! But on the other side of the coin, I’ve run several trail races, this was her first trail adventure! Something new for both of us tho! Even as we approached go time, I still found myself with apprehension. Was I really ready for this? It didn’t help that it was already starting to get warm and humid. At 5am, we were already looking at temps nearing 75 degrees and it was only going to go up from here! EEEEK! But that didn’t stop of from staying upbeat and focused! We were here and it was go time! At precisely 5:08am, we were on our way! No matter how hard you try, starting out slow for a race is tough. You have that natural instinct to try and stay with the pack. To run with everyone else. I knew that this was NOT what I wanted to do and during that first loop, I tried really hard to NOT push my pace. After all, I was going to be out here for the next 8 hours! I realized very quickly that when I race starts at 5am, the first few miles are like no other! Most races don’t start until 7 or 8am so you end up missing the best part of the morning! Sunrise! This morning I felt like I had been transported to an alternate reality. 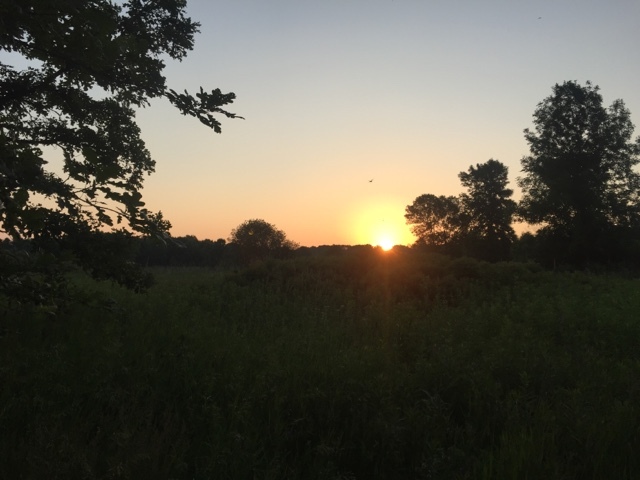 When we hit the prairie on this first loop, I felt like I had been whisked out to the Serengeti just in time for the sun to peak over the treetops on the horizon! I couldn’t help be slow down and enjoy the beauty of the morning! It was so quiet and peaceful out there and it was a very invigorating way to start the day! 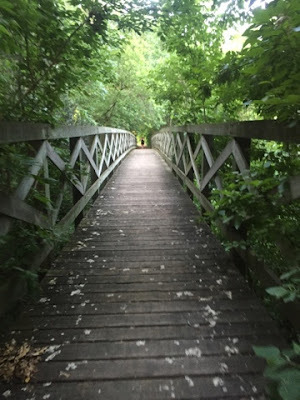 Anyone who walks or runs these trails is familiar with “the big bridge” near the golf course. Since we usually park at the golf course when we run out here, this is usually either at the beginning of each loop or right near the end. Since, for this event, we were running the loop counter-clockwise, today the bridge was a symbol of completion… of another loop. I was looking forward to crossing this bridge many times over the course of the morning! And I will tell you, each time I hit the bridge, it was definitely a feeling of accomplishment! Another 4.7 miles was nearing completion! On loop 3, I started running with Nicole and she was the motivation that I needed many times to keep pushing forward! By 8am, it was already starting to get warm, so we starting talking strategy for the last hours… and you we were going to deal with the heat and humidity that Mother Nature was throwing at us. We ended up running together for about 2 1/2 loops and it was a pleasure to have her company! 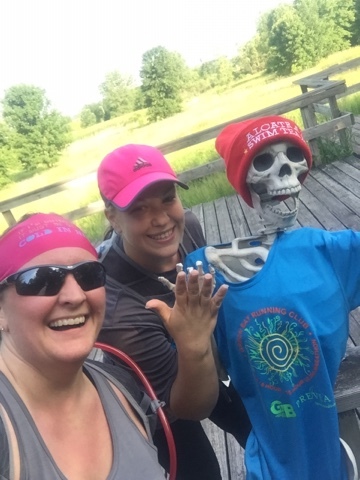 On the back side of the course, Alicia had brought out her friends Jack and Jill to hang out and cheer us on as we ran our loops! They set up camp near the observation deck and had fun, providing runners with many laughs throughout the day! Nicole and I had to stop for a selfie on one of our laps and high-fives were present all around! Over the course of the morning, runners set about to enjoy quiet trails, friendships and laughs with fellow runners, tasty snacks at the aid stations (I forever have a new appreciation for watermelon!). One of the best “perks” of the morning? Starting on the second loops of the day, the second aid station had cooling towels for all runners! The first time I passed through, you were given a brand new towel and directed to the huge bucket of ice water! A quick dip of the towel in the bucket and you had your own personal cooling towel!! Before you left the aid station, you were given a clothespin with your bib number on in it, with which you used to hang your towel on the line to hang until you came back around the next time. By the time we came back around on the next loop, all of the towels were hanging on the line, in numerical order! Another quick grab of your personal towel, you were ready for another cool off! 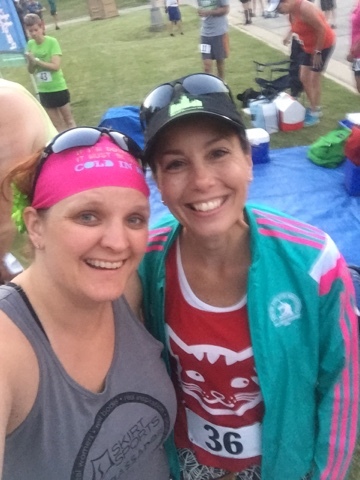 After 5 loops (23.75 miles), my legs were on fire, so I opted to take a break and go see my good friend Christine, massage therapist to the stars, who was spending her days taking care of all of us crazy runners who were putting our bodies through all this craziness. She asked what I needed… “new legs” was about the only thing that I could think of! 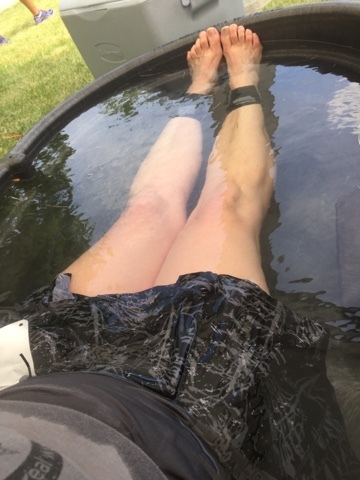 after working on cooling off a few other overheating runners, she worked on bringing some life back to my legs! At this point, my goal was 1 more loop. Just one more! I knew that I was not going to hit the 50k that I was originally hoping for, but maybe I could at least get 1 more loop in (28.5 miles). Once Christine got done manhandling my legs, I grabbed some fuel and headed out for my last loop. At this point, I was 6 hours and 20 minutes into my adventure. I had 1 hour and 40 minutes to finish this last loop. In most “normal” situations, this would be a no brainer. Today, it was going to be a challenge. But I headed out. By the time I got to the bottom of the first hill, I knew that this loop was going to be slow. Although my legs left like they had some more life in them, they were spent. I was forced to slow down to a walk. But I was ok with this. I was still moving forward. I was going to keep moving. By the time I made it around to the second aid station, I was walking at a turtle pace of 17 1/2 minute miles. My legs were shot! I wouldn’t even get them to run DOWN the hills. The heat finally got the best of me. My body was done. I am not going to bore you with all the crazy thoughts that went through my head over the course of the day, but I will tell you that they were not always positive. I always try my hardest to maintain a positive attitude, but 6 hours into a run, sometimes the positive, motivating thoughts are not always there! It was tough, it was hot, it was hilly, but it was one of the most rewarding days so far in of the adventures I have been on! In the end, I completed 26.68 miles (according to my TomTom) in 7:24:04. I completed more miles that I EVER have before and I was still on my feet! I have zero regrets about what I did this morning! After getting a ride back to the start line/main aid station, I was greeted by several friends with hugs, congratulations and cheers. One of the first people that I saw when I got back was one of the “Ice Boys” from Snowdrop Foundation who were out there to help keep everyone cool. About the same time, fellow runner and former workout buddy at the gym, Asha, came to find me. As we were talking, Ice Boy stopped and held an ice pack to the back of my neck. Once he realized how warm I was, he asked Asha to hold the back of my tank top away from me… and he proceeded to dump half of his bag of ice water down my back. for the first time in my life, I didn’t swear at someone for dousing me with ice water! 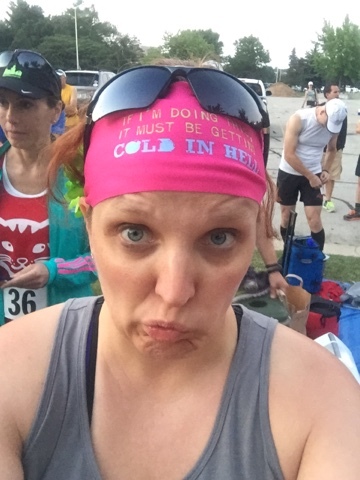 It felt amazing… and then realized just how warm I was. 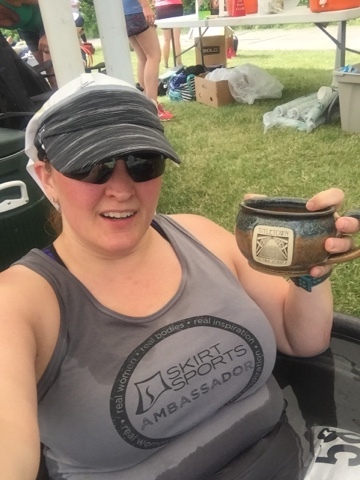 Once I got over the initial blast of ice water, grabbed something cold to drink and picked up my finishes mug from Scott (assistant race director), I headed over to the huge ice bath that was waiting for overheating runners. Another fellow runner was just getting out and it was my turn! For the first time EVER, I was going to voluntarily sit in a ice bath! Actually this was the first time that I even considered it! OMG – what an amazing 15 minutes! After my ice bath and a top at the Golf Course clubhouse to pick up my lunch (another awesome perk of the race!) I headed home. It was not until after I took a shower that it hit me how hungry I was! I headed back downstairs and literally inhaled the pulled pork sandwich I brought home and the proceeded to devour one of the cupcakes that Asha had waiting for me at the finish line! (sorry Asha, not even sure if I tasted that first one since I ate it so fast!). And if you already weren’t calling me crazy… after I relaxed for the rest of the afternoon, I headed to the ballpark to watch (at least part of) the Bullfrog baseball game! The running community is a unique environment that, until you are part of it, you really don’t understand the magnitude of this fierce beast. I don’t know of too many other places where you can get together with a group of strangers, instantly feel like you have known them forever and spend your time laughing. Yes, I know that this post was a little longer than my normal race recap for a single race, but there was no way to condense it, without losing part of amazing-ness of this day (Yes i know, not really a work, but I’m using it anyway! I want to say think you to my friends who always are there to join me on training runs, my family that puts up with my crazy ideas, adventures and training schedule and all of you out there that keep me motivated to do more. 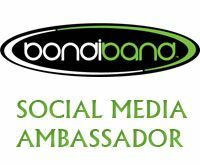 It is amazing what you can do when you have people that support you, encourage you and believe in you! I owe so much of my success to all of you! Thank you for always believing in me, encouraging me, motivating me, pushing me and above all being there for me! No one said this was going to be easy… but it is going to be worth it! Amy your a beast and what an awesome accomplishment and you should be so proud of yourself!!!!!! Thanks Deanna! It’s been a fun ride full of crazy adventures and I am grateful for all of them! Welcome to the new and (hopefully) improved site! Subscribe to get my latest content delivered right to your inbox!